Unionist members on Antrim and Newtownabbey Borough Council have voted in favour of an ‘English only’ policy in relation to street signs in the borough. The move follows a request to council from Abbeyville Residents Association for five street signs to be expressed in Irish. It is understood the cost of providing a street name sign is approximately £250. Ahead of Monday’s meeting, councillors were informed the local authority did not have an existing policy in place to deal with this request and their views were sought on whether one was required. Statistics from the 2011 Census, detailing the languages spoken by residents in the borough, were made available to representatives. In total, 129,013 residents aged three and over spoke English as their first language. Polish was the second most used language with 1,165 people using it as their first language, while 309 spoke Lithuanian, 229 spoke Slovak and 228 people over the age over three spoke Chinese. The figures showed that 176 residents over the age of three spoke Irish Gaelic as their first language. A total of 6.52% of residents had some knowledge of Irish. 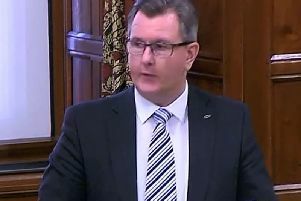 During a discussion on the issue, the DUP group leader, councillor Phillip Brett proposed an English-only street sign policy. This was seconded by UUP group leader Mark Cosgrove. Alliance representatives, councillors Billy Webb and Neil Kelly, proposed an amendment to allow consideration if there is support in the area for multi-language signs. This amendment was defeated during a show-of-hands vote. Mr Brett’s proposal carried following a recorded vote with 27 members voting in favour and eight against. After the meeting, the DUP Macedon representative, Thomas Hogg MBE, said: “I condemn the recent petition for bilingual English and Irish street signage in the Abbeyville area of Whiteabbey and welcome the decision to adopt a policy of English only. Speaking to the Newtownabbey Times, Mr Webb said: “I proposed we needed a policy to deal with situations such as this when an area requested other language street signage. “I proposed that the council look at a policy on multi-lingual signage. It is shameful that Sinn Fein have politicised the Irish language for their own ends and that the DUP and UUP have fallen to their level by their reaction. “What was proposed was that because of the request made, we should have a policy. At no stage either in the proposal, or the debate, did I or my party colleagues say that there should be signage in Irish and English.